"Risë Nagin's rectangular fabric constructions are often called "art quilts," but they are not restricted to developments within the field of textiles alone. Instead, the appliquéd works are natural outgrowths from her prior training and ongoing interest in painting. The artist actually describes herself as "a painter who puts things together in a particular way." But by choosing silks, velvets, acetates, chiffons, cottons, and other dyed cloths—and incorporating metallic glitter and cellophane—Nagin is able to achieve visual effects beyond the scope of oil and acrylic paints. In her multitextile, layered compositions, she can actually create—rather than illusorily suggest—the transparency and luminescence that painters seek with glazes. In 1977 Risë Nagin first began to superimpose layers of translucent fabrics to construct zones of luminous color. Subtleties in hue were further enhanced by washes of acrylic color brushed onto commercially dyed textiles. She also left areas in her compositions unlined to allow light to penetrate sheer fabrics. Training in papermaking also broadened her experience in materials and methods of construction, and in the early 1980s she began to employ stitching not simply as a technique, but as a strong graphic element in her designs. Much of her work from the 1970s and early 1980s was made to be worn. Because its shape did not disrupt the flow of her designs, the kimono was a favored format. Decorative patterns were composed of abstracted images derived from trips along the Pennsylvania Turnpike—zig-zag tire treads, diagonal guardrails, truck grilles, directional arrows, and snatches of passing scenery. Since it wrapped around the body, the kimono, she argued, was like the cocoon of an automobile interior. But not all of Nagin's works from the 1970s are wearable objects. 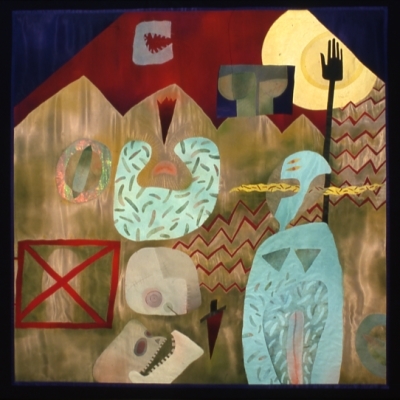 Her award-winning Night Swarm (1979) [1993.54.11] is a "fabric painting" meant to hang on the wall. The central image is a landscape viewed through a window from inside a house. Elements include a composite image of a tree depicted, as in a cubist composition, from different angles, and a graphic impression of a swarm of flying insects—in this case a direct reference to a colony of bees that once swarmed outside Nagin's window, obscuring the light. The view from a domestic window is a poetic theme common to Romantic painting, but in Night Swarm, interior and exterior environments are not separate spaces, but meet commingled in a single zone.